Phil was a member of the S.H.S for many many years, filling most of the different roles over the years, from expedition member (Jura 1965, Lewis 1966) then on to Assistant Leader (1967 Colonsay) and Leader (Vatersay 1968, N Uist 1970, Rhum 1971, Harris 1973, Colonsay 1975 and finally Lewis Mealista 1977). His roles on the committee where numerous and varied, I spotted he was in charge of stationery, updated clothing list and by 1968 was in charge of stores. He became a director in 1969 (unfortunately my scan of the 1969 report has him as P Resold -one to correct when I get time!). By 1970 and the retirement of John Abbott, Phil took over as Chairman of the Society. Search pretty much any of the annual S.H.S reports from his first trip in 1965 and you will find mention of Phil, he was a driving force in the success of the S.H.S. He was Chairman from 1970 until 1976 when he stood down and Roger Weatherly took over, but he remained with the society as a director. He again took the helm as Chairman from 1983-1986. It was in June 1986 that Phil had to manage the task of trying to save the society by calling an EGM requesting people to bring proposals to the meeting on how attract new members and keep the expeditions running. [See the letter on the reports and documents page]. Phil, like so many others, worked exceedingly hard to help run the S.H.S and almost certainly didn't receive the thanks due to him at the time so I hope this will act as a reminder to all of the work that he put in to making the S.H.S the success it undoubtedly was. Phil Renold, Lathrop High School exchange teacher in 1978-79, recently passed away, according to Don Gray, his exchange partner. Both were participants in the Fulbright Exchange Program between American and British teachers. Phil was born in Port-of-Spain, Trinidad, in 1949. He grew up in England, and attended Gordonstoun School where he was instilled with a strong sense of public service. There he knew Prince Charles, and during the 40 years he taught in England, led his students in the Duke of Edinburgh's Award Program. He obtained degrees in politics, contemporary history and economics, and outdoor pursuits at Coventry and Bangor Universities. A mountaineer, he climbed peaks in Great Britain and Europe before coming to Alaska. During his time here, he successfully climbed Mount McKinley. He found differences between the Alaska outdoor life and that of the U.K. He was amazed by an outboard engine attached to a canoe while on a float trip down the Upper Chena to Nordale Road. American customs, like our celebration of Halloween, also surprised him greatly. He told stories of life at -40 degrees when in England, and how a cup of boiling water tossed in the air froze before reaching the ground. Phil returned to Saddleworth School in Uppermill, Lancashire, England, returning to Fairbanks in 1981, to marry his English sweetheart, Rosie, and visit his Fairbanks friends. Rosie and Phil had two sons, John-Michael, now a math teacher, and Will, now an aeronautical engineer. Earlier, Rosie and Phil acted as foster parents to troubled youths in the Saddleworth district. Phil then taught at Frankfurt International School and, after several years in Saddleworth School, at Batley Grammar School, where, besides politics and economics, he also taught business studies, geography, IT and religious education. He became a Sub-Lieutenant in the Royal Navy to help the DOE program. 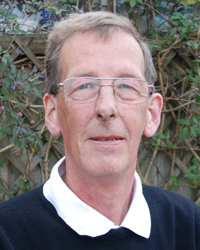 Last year, Phil ran as a Liberal Democrat in the Oldham Council election and served on the Saddleworth Parish Council.